John and Teresa Janiszyn, who’s family owns and operates Pete’s Stand in Walpole NH, started losing some of their long-held rental land to development in 2011. Through a conversation with Mike Ghia, LFG field agent, the Janiszyns solicited help to begin the work to stabilize their land base. Mike arranged for the family to meet with Ian McSweeney of the Russell Foundation and three of the Janiszyn’s landlords to discuss conserving the farmland. 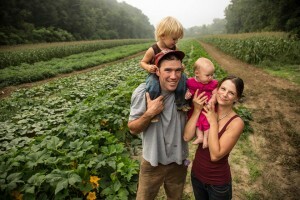 The 8-acre field along the Cold River, owned by Perley Lund of Gilsum, is a vital parcel of land for the Janiszyns who rely entirely on a network of rented land to grow vegetables for their successful farm stand. Property owner Perley Lund immediately demonstrated a commitment to conserving his land so Monadnock Conservancy was brought in to facilitate the sale of a conservation easement. LFG and the Russell Foundation both provided support to Monadnock staff as they worked through the process and the fundraising. Thanks to Perley Lund, numerous donors and the work of the Monadnock Conservancy’s Farmland Protection Program, 9 acres of prime farmland along the Cold River in North Walpole NH are protected, and continues to be farmed by the Janiszyns. The Monadnock Conservancy successfully secured funding from numerous sources including Conservancy donors, the Moose Plate grant program, the Russell Farm and Forest Conservation Foundation, 1772 Foundation, and Thomas Haas Fund of the NH Charitable Foundation. Work continues to help the newest generation of this 3rd generation farm to secure long-term tenure on some of the best soils anywhere in the US. Read more in Monadnock Conservancy newsletter. Pete’s Stand is a small vegetable farm nestled in the fertile Connecticut River valley of Walpole, New Hampshire. Started by World War II veteran, Pete Janiszyn, the farm is now managed by his grandson, John. Pete’s Stand offers fresh, reasonably priced produce that is picked daily. Open June to October (wholesale or by chance earlier or later). If they don’t grow it there, they get it locally: baked goods, jams, and syrup, with the customer service only a family-owned business can provide.